I’m not sure quite what to call this, a review, or just a nostalgia overload. In Either case, I’m here to talk to you about ChexQuest. ChexQuest at its heart is an advertisement, but for me, it brings back memories of just pure fun. I remember walking through the store with my parents, and upon seeing a game available in a cereal box, I WAS THERE! I begged my parents for it, and clutched my prize with joy. Cereal Dimension”. This may have been the first FPS I had ever played in my life, and I loved it. The colorful graphics pleased my senses, as I zapped green gooed aliens. At my age, it was slightly scary, at least the flying aliens, but more importantly, it was the best 3D (ish) videogame entertainment I had at that early age. Now, years later, I have found out that Chex Quest 3 had been released, the third, and likely final episode, so, loading the game up on Easy. (Don’t judge me, I’m not a big fan of Doom or its mechanics, and it still is challenging on easy if you fight everything.) I checked it out. Well let me tell you, the graphics are not why I play this game, but there is obviously an extra sense of graphical polish that has come with this third episode, released 2008. The work of former Digital Cafe employees whom returned to finish the last campaign; their time elsewhere in the videogame market have visibly increased their skills. The graphics for the textures are clean, and seem more varied, with new texture sets, some used just for single levels. 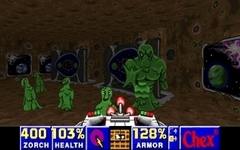 The writing will be primarily about Chex Quest’s Third episode, but I urge you to play through all the episodes just for the pure thrill. Monsters: A couple new and fierce monsters fill the ranks. They are not super different than what came before, but there are more varieties. There in an additional flying type, which is a pain, and is a heavy trooper too in that it takes lots of punishment, fires heavy globs of goo, and follows you aerially; there is no escape. There is a new ground type which is fast, attacks less than usual enemies, but takes a lot more punishment than conventional fodder, reminds me of a supped up AT-ST. Furthermore, there is a bomb-like dashing enemy that only appears in the last level. Lastly, there are 2 boss type monsters that only appear on one level each. Levels: Everything new is welcomed, and I additionally appreciate how, while taking place in different environments, they still pay homage to the original idea of advertising, including a Chex lodge in a national park. 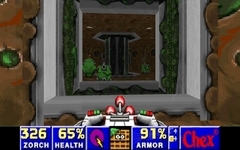 The first level, and the town one are not quite as good in level design as the other levels, and are too reminiscent of the second episodes. Compared to the other campaigns, it seems the second episode had a better sense of creative direction, while here, although a few are new and cool, they don't seem quite as original. In your adventures, you shall be visiting a military base, a national park, an asteroid, and a town. 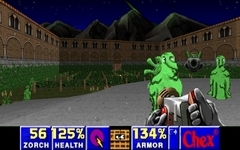 A few of the levels make use of the advanced features of the enhanced ZDoom port. One such are the slanted platforms (especially on the last level of the game), which act as climbable ramps. 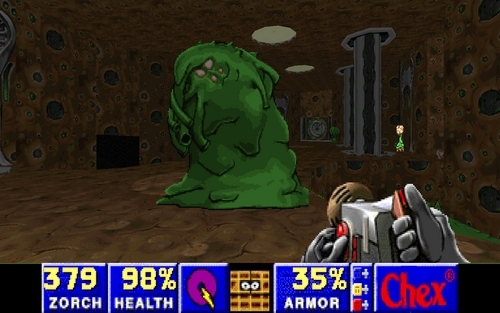 ZDoom also allows green glop that splashes against the wall like blood when the enemies are hit. 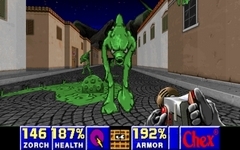 While blood existed like this in the original Doom, I don’t think the green blood would splatter in the original Chexquest, however ZDoom allows this, and surprisingly the developers changed blood color to green, even when it wasn’t necessarily used. (I used the original WADs once with ZDoom, and the blood was green, even before this all in one pack with a modified ZDoom). Looking back on the original levels, they appeared plainer than the later levels in decorations, meaning that for the most current campaign, the developers could more easily ignore item limits of the default Doom engine, and use the limits of ZDoom for item placement/monsters. This is especially apparent in some new rooms covered in fauna or trees. A moving landscape completes the enhancements I appreciate. 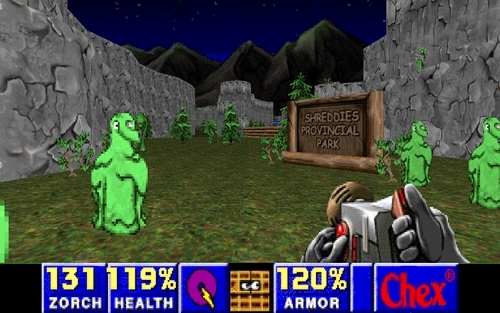 Before the official Chex Quest 3 was released there was an enhancement of the original Chex Quest levels, in a mod called “The Ultimate Chex Quest”. It attempted to spruce up the game with enhanced visuals; fixing landscape viewing errors, adding continuality in spawn points, and adding 3D objects (like the stools in the bar in the E2L1. The website for the mod however is on hiatus, possibly indefinitely, but I liked what I saw. It is unfortunate it all wasn’t transferred to the official Chex Quest 3 pack, because it had good things. Weapons: No new weapons, but with a spoon of death, and a Gatling spoon for that matter, what other weapon do you really need? Can you say best melee weapon ever? Story: Story is nonexistent in the new content except the Flemoids, the alien race, continue to invade. In the 2nd episode they invaded a town, and here they seem to be pushing into military bases and national parks. Zorch them back to their own Dimension! Story is unimportant though, this isn’t Marathon here, this is about zapping things with your zappy gun. Until you put up this article, I completely forgot about this game. I Just remembered killing sludge with the spoon, which is pretty nightmare inducing. One of the worst ways to die - spooning, and not the good kind.